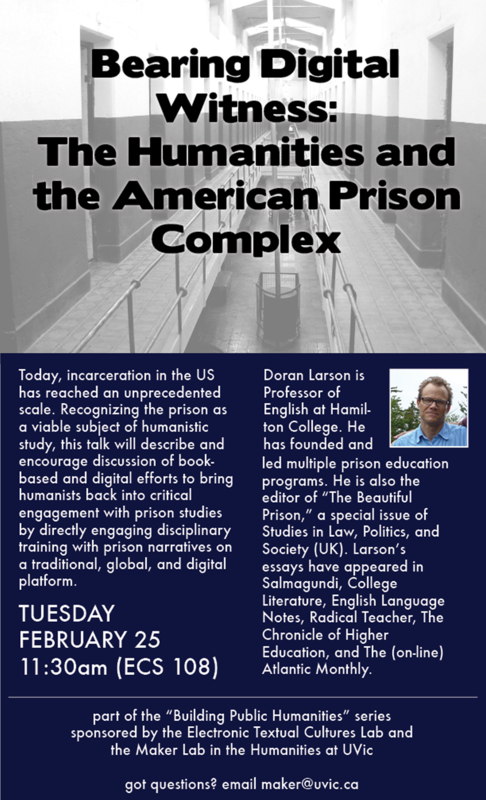 As part of our “Building Public Humanities” project, and with support from the Electronic Textual Cultures Lab, Doran Larson will be visiting the University of Victoria on Tuesday, February 25th to give a talk (at 11:30am in ECS 108) on the intersections of prison studies with digital studies. A professor of English and Creative Writing at Hamilton College, Larson teaches courses in prison writing, the history of the novel, 20th-century American literature, and creative writing. He has published articles on Herman Melville, Theodore Dreiser, Henry James, and popular film. Since November of 2006, he has taught a creative writing course inside a maximum-security state prison. Larson’s essays on prison writing and prison issues have been published in College Literature, Radical Teacher, English Language Notes and The Chronicle of Higher Education. He is also the author of two novels, The Big Deal (Bantam, 1985), and Marginalia (Permanent, 1997). Larson’s stories have appeared in The Iowa Review, Boulevard, The Virginia Quarterly Review, Alaska Quarterly Review, and Best American Short Stories. The Iowa Review published his novella, Syzygy, in 1998. He has also published travel writing, magazine features, and paid op-eds. A poster for the event is below, and the talk—“Bearing Digital Witness: The Humanities and the American Prison Complex”—is open to the public. Please spread the word (poster included) to anyone who might be interested. See you on Tuesday the 25th at 11:30am in ECS 108, everyone! We are thrilled about this event and want to thank Doran Larson for taking the time to visit us. Post by Nina Belojevic, attached to the BuildingPH project, with the news tag. Poster for the event care of Nina Belojevic and Jon Johnson.